Wilella Sibert Cather was born on December 7, 1873, and spent her early years on her maternal grandmother’s farm in the Back Creek Valley near Winchester, Virginia.Â The Cathers moved to Nebraska in 1883, when she was nine years old.Â At first, her father tried his hand at farming before moving the family into the town of Red Cloud, where he opened a real estate and insurance business. As a student at the University of Nebraska in the early 1890s, Cather had planned to major in science and to become a physician. Â However, after her essay on Thomas Carlyle was published in the Nebraska State Journal during her freshman year, she changed her major and graduated in 1894 with a B.A. in English. Cather is best known for her works depicting frontier life, most notably her Great Plains trilogy which includes the novels O Pioneers! (1913), My Ãntonia (1915), and The Song of the Lark (1918). Â In 1923, Cather received the Pulitzer Prize for One of Ours (1922), a novel set during World War I. After college, Cather made her home in Pittsburgh for ten years, then moved to New York, where she lived the rest of her life.Â On April 24, 1947, Cather died of a cerebral hemorrhage at the age of 73. 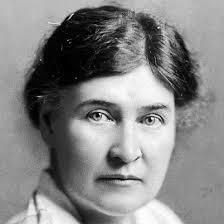 Visit the Willa Cather Foundation website.